Amaretto celebrated the 2016 Holidays with 2016 Christmas Limited Edition with these 3 amazing horses! They were for sale from December 16, 2015 to January 2, 2016. 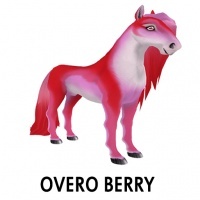 The Overo Berry was the hidden surprise in the 2016 Christmas Limited Edition. Overo Berry Coat DOES have the ability to pass! This page was last edited on 12 January 2017, at 20:29.